The Associated Press has tracked recent, ongoing shipments from one such factory inside an internment camp to Badger Sportswear, a leading supplier in Statesville, North Carolina. The shipments show how difficult it is to stop products made with forced labor from getting into the global supply chain, even though such imports are illegal in the U.S. Badger CEO John Anton said that the company would source sportswear elsewhere while it investigates, and the U.S. government said on Dec. 19 it was reviewing the reports of forced labor at the factory. Chinese authorities say the camps, which they call training centers, offer free vocational training for Uighurs, Kazakhs and others, mostly Muslims, as part of a plan to bring minorities into “a modern civilized’’ world and eliminate poverty in Xinjiang. They say that people in the centers have signed agreements to receive vocational training. The Xinjiang Propaganda Department did not respond to a faxed request for comment. A Chinese Foreign Ministry spokeswoman accused the foreign media of making “many untrue reports’’ about the training centers, but did not specify when asked for details. “Those reports are completely based on hearsay evidence or made out of thin air,’’ the spokeswoman, Hua Chunying, said at a daily briefing. As China faced growing international pressure about the detention camps, its state broadcaster aired a 15-minute report in October that featured a “vocational skills education and training center’’ in the southern Xinjiang city of Hotan. 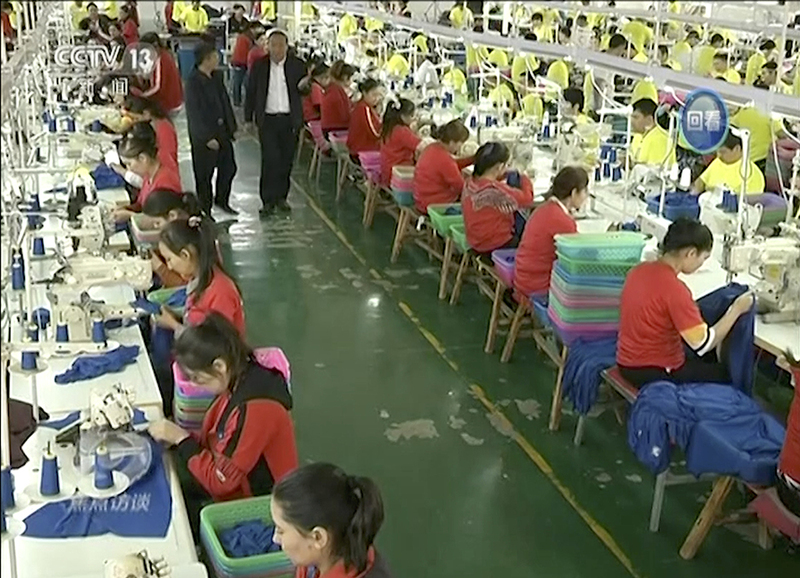 Wu Hongbo, the chairman of Hetian Taida, confirmed that the company has a factory inside the same compound as the training center featured in the China Central Television report. Hetian Taida provides employment to those trainees who were deemed by the government to be “unproblematic,’’ he said, adding that the center is government-operated. “We’re making our contribution to eradicating poverty,’’ Wu told the AP over the phone. Badger chief executive Anton said that his company has sourced products from an affiliate of Hetian Taida for many years. He said about a year ago, the affiliate opened a new factory in western China. Anton confirmed Badger Sportswear officials visited the factory and have a certificate that the factory is certified by social compliance experts. “We will voluntarily halt sourcing and will move production elsewhere while we investigate the matters raised,’’ he said. In recent years, Badger imported sportswear — jerseys, T-shirts, workout pants and more — from Nicaragua and Pakistan. But in April this year, it began importing 100 percent polyester T-shirts and pants from Hetian Taida Apparel, according to U.S. customs data provided by ImportGenius, which analyzes consumer shipments. The address on the shipping records is the same as for the detention camp. It’s unclear whether other companies also export products made by forced labor in Xinjiang to the U.S., Europe and Asia. The AP found two companies exporting to the U.S. that share approximately the same coordinates as places experts have identified as internment camps, and Chinese media reports mention “training’’ there. But the AP could not confirm whether the companies use forced labor. “They didn’t teach me anything. They were brainwashing me, trying to make us believe how great China is, how powerful it is, how developed its economy is,’’ said Kairat Samarkan, a Kazakh citizen who said he was tortured with a metal contraption that contorts your body before being released in February after he tried to kill himself. “We will try to achieve a seamless connection between school teaching and social employment, so that after finishing their courses, the trainees will be able to find jobs and earn a well-off life,’’ Zahir said. The forced labor program goes along with a massive government initiative to develop Xinjiang’s economy by constructing enormous factory parks. Another internment camp the AP visited was inside a factory compound called Kunshan Industrial Park, opened under the national anti-poverty push. A local propaganda official, Chen Fang, said workers inside made food and clothes. A hospital, a police station, smokestacks, dormitories and a building with a sign that read “House of Workers’’ could be seen from outside the surrounding barbed wire fencing. Another section resembled a prison, with guard towers and high walls. The AP did not track any exports from Kunshan to the U.S.
Four months later a stranger contacted Kaliaskar online and confirmed her fear: her daughter had been detained for “political training.’’ The next spring, she said she fainted when two cases of her daughter’s clothes were delivered to her home in Kazakhstan. “I never asked the government to find work for my husband,’’ said Mainur Medetbek, whose husband did odd repair jobs before vanishing into a camp in February during a visit to China from their home in Kazakhstan.